The simple answer is "by learn to swim slow with correct technique". This in turn reduces your body's drag and increases your propulsion force. Swimming slower rather than faster is a bit against the common sense, however, it is the way to go trust me. It is actually the hardest thing you will have to learn on your journey to effortless swimming. Convincing swimmers to slow down and forget about how many laps they do and how fast they swim is also the hardest thing for coaches to be able to do. Most swimmers usually say "yeah right, you are crazy. Why would I swim slower? ", but when they make the switch and start seeing the progress, they usually buy into this concept and are better for it. Before you go on, I have a small exercise for you. Next time you are in the pool try the following exercise for yourself and see that I am not just pulling your leg. While swimming your normal laps, slow down in your normal body position and stroke technique to a slow motion like movement and see what happens to your body. More than likely it will be very difficult for you to swim at that speed and stay afloat in the same way you are when you swim faster. This is actually one of the reasons why people do swim faster as they are compensating for lack of correct body position with speed. Do you remember the young thugs in the lane next to you that jump in and suddenly start to thrash at the water as fast as they can and stop all out of breath when they get into the other side? Well, this is exactly what I am talking about. Besides being very annoying nuisance in the swim lanes, they cannot keep afloat unless they thrash around like that with their muscular body :). There are a few reasons why we want to slow down initially. Let's say you are learning how to tie your shoes and someone shows you at their regular speed. You will not grasp the movements. However, if someone takes the time and shows you the movement one by one in a slow motion and even tell you the loop it and swoop it or bunny ears poem, you are more likely to have a better start and will remember how to do it. Then you practice it very slowly until the movements become natural. When the movement is imprinted into your motor skills you can tie your shoe in stealth speed without even thinking about it. With swimming, it is very similar. When you do not learn the proper streamlined body position, arm movement, head position, catch and relaxation while swimming slow, your body will produce too much drag and turbulence while you swim, thus making swimming a much harder activity then it actually is. Which in turn will make you slower as you cannot sustain speed over long period of time. Remember, water is much denser than air, so moving through it requires a much more streamlined and thought out movement then when you move through the air. What I want to teach you is to save energy while swimming by streamlining your swimming, so you swim effortlessly and are the flower among the thorns in the pool. Now, are you with me here or are you still thinking I am nuts. I am not going to lie to you, slowing down and learning the proper technique and body position at a lower speed takes a lot of patience as your mind will always tempt you to go faster. You might feel you are not exercising enough and wasting your valuable time, however, if you are serious about learning how to swim properly, more efficiently and faster, I challenge you to bare with me and slow down. In the next articles, I will take you through a set of exercises (phases) which will help you build up your stroke and save valuable energy during your swims. Whether you are doing laps in the pool or stroking away in the open water, the slow down approach is a must. Now, on the subject, I due recognized the importance of floating on water before ''swimming''. Practicing the ''dead log''---> adjusting your upper body (arms, chest) and your lower body (legs, etc.) are must as you said. Then, comes the floating and before you know it, you start moving your legs and your arms to ''push'' the water in the opposite direction to where you want to go. Nonetheless, as you said it in this article, to compensate our inability to float well, we swim as fast as we can and if you are not correctly breathing air while swimming (inhale the air by turning your head on the side)well, you quickly miss air and stop in your track. I)My question is: how do you inhale air properly? -Today,during my swimming lessons, I wore a ''floating belt'' if I may say so and I dived in the deep side of the pool. I immediately sank and could not swim at the surface. I was exhaling air by making bubbles, I moved my arms, but I presume my legs weren't following. Then, I panicked because I was missing air and I felt desperate and powerless. @ Lorient: thanks very much for your thorough comment. I am glad you are taking the time to read my swim advice. 1) how do I inhale properly? - You need to take a deep breath and see your chest rise when you take it. I find that many people struggle with exactly this. They try to take a breath, but it is a breath via stomach breathing and not chest breathing. So, inhale to see your chest rise. This will make sure you get enough air in your lungs to float. If you start blowing bubbles, you are releasing the air and thus you will start sinking, so hold your breath during your floating exercises. 2) How to float in deep end of the pool? - there is no difference between floating in shallow end and deep end. The water is the same and if you learn how to float in the shallow end you'll be able to do this in the deep end. I know this doesn't really explain much in terms of floating or breathing in detail, but it seems to me that you need to learn how to relax in the water by doing a few simple sinking exercises. I will put some videos for you and add a post here soon. stay tuned. Thank you very much! 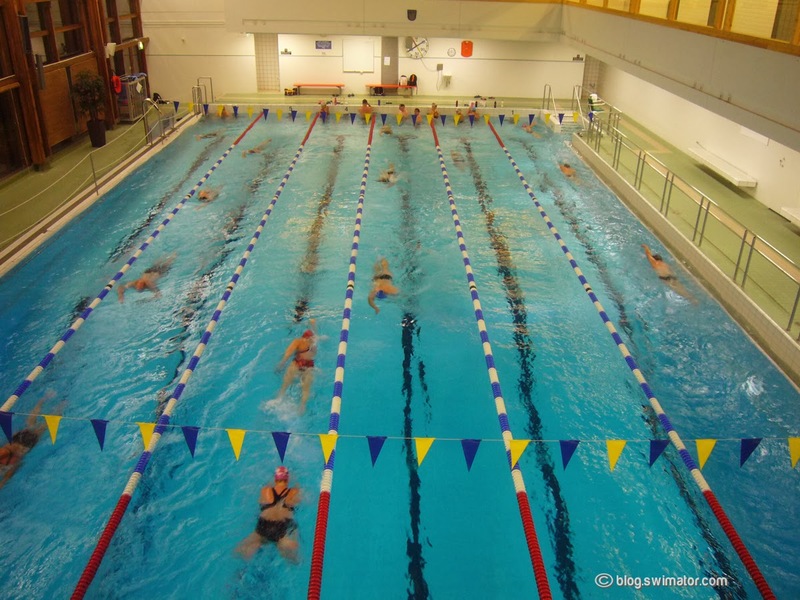 By combining your tips and my teacher's instructions, I have been able to swim successfully and, more importantly, I have been able to help other members of the course to progress further in their development. @Lorient: that's great you are improving. Well done. I am not too clear on your question, however, when you mentioned "keeping your head out of the water" it sounds a red alarm :). Head out of the water is only in the case of breathing which is only like 10% of your time spent swimming. The rest of the time, your head should be under water, so you can float easier with little or no effort. Also, when you mention having a problem with balance. Many beginners have issues with the feeling of tipping over. Try to fight this feeling and don't try correct your position on the water. Your body is like a boat, it rocks back and forth, but it will not tip, so not need to tighten all your muscles to try to keep yourself straight. Thank you for your article, it was interesting to read, but unfortunately when I swim at a slow speed as you suggest, I am still exhausted after only swimming from one side of the pool to the other. I am taking deep "chest" breathes with every third stroke, I have a streamlined position, and I am wearing jammers, but I still feel utterly exhausted when I swim. If I were to identify my problem, I would say that I am expending way too much energy as I swim, but I don't know how I am doing it or how to relax and expend less. I am teaching myself how to swim and am currently not taking lessons. Thank you for reading my post. @Blazius: thanks for sharing your swimming experience. You are correct about the fact that you expand way too much energy swimming. My guess is that you kick too much and you try to fight the water instead of letting the water float you. If you take a deep breath, lay yourself into the water and fully relax, you should not exert much energy at all. Try some of these swimming exercises to get your body into the right position. You also want to make sure that you have good form when swimming. This will help with performance. I am currently taking swim lessons and was kicking at a slow/moderate pace(similiar to when I used fins when snorkeling) and instructor advised me to kick faster. Says I should be using a fast flutter kick instead. It feels unnatural to me and is tiring. Do I just need to work on conditioning or should I stay with the speed I was comfortable with? @mytripletsrock: I am just guessing here, but perhaps the instructor meant it in a way that your kick is too big (too much up and down motion) if you kick slow. So by increasing your kick's speed you automatically are forced to make a smaller kick. 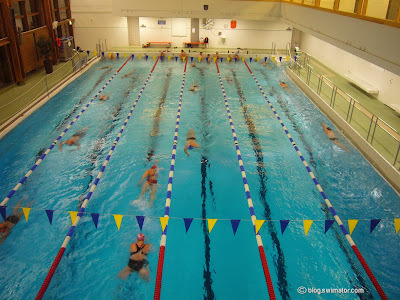 You should be able to do both, have a slow kick and fast kick, however, not that if you swim up and down the pool (not only kicking, but swimming), your kick does not need to be fast. You can take only one kick per stroke (2-beat kick) to conserve energy. That said, fast kick conditioning is always good :). Especially when done in a vertical position in a deep end of the pool. I just started taking swimming classes.In my second class deadlog should be performed. I tried many times I could float my feet but the problem is I am getting carried away to the left side.It happened all the times. Please suggest me some tips. @Nebulus: Thank you for sharing your floating difficulty. Two things to keep in mind: 1) could it be that there is a current in the pool? 2) if not current, then you'll need to work on body balance, working with the core muscles of your body (your mid section) to stabilize. Good luck.